Products in this section are generally useful tools and devices that don't fit into any of ECROS Technology's specialist categories. They include devices that are useful to both professionals and enthusiasts, such as the Mini-PSU, and projects intended mainly for enthusiasts, but also teachers, such as the Traffic Lights Project. Introduce yourself to embedded systems design with a project that has familiar, real-world goals! Start by flashing LEDs and end up with a system as complex as an actual traffic intersection. 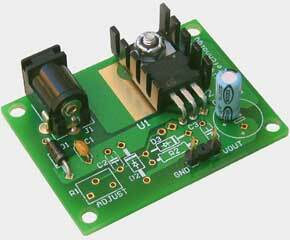 One low-cost and flexible PCB design can meet many of your regulated power supply needs. Use it to build fixed and adjustable output supplies, freestanding, in a small enclosure or mounted on your project board.